The nine join 13 other players who signed with the Roadrunners during NCAA's early signing period in December. SAN ANTONIO — For decades, the first Wednesday in February meant only one thing to college football coaches: National signing day. But with the NCAA instituting an early signing period in December two years ago, the first Wednesday in February has lost most of its sizzle on the sports calendar. “Now it’s the late signing day,” UTSA coach Frank Wilson said Wednesday. Wilson announced the signing of nine players who will join 13 other student-athletes who signed with UTSA in December, about a month after the Roadrunners finished their eighth season 3-9 overall and 2-6 in Conference USA. Coach Frank Wilson, running on the field with his players before last year's home opener against Baylor, is 15-21 in three seasons at UTSA. UTSA’s 2019 signing class is composed of 13 offensive players, eight offensive players and one specialist. The class includes three players from the San Antonio area – Brandeis tight end Oscar Cardenas, Judson running back Sincere McCormick and Judson safety Rashad Wisdom. All three signed in December, and McCormick and Wisdom enrolled at UTSA last month. “Usually in this last week we’re able to do a ton of junior recruiting, and start working on the next class,” Wilson said in a news conference late Wednesday afternoon. “It’s what we’ve been able to do in the last year, or so. This year was a little different. We aimed a little higher. The competition, the recruits that we desired and we went after had a lot more going on than in some previous years. In the end, UTSA was like most universities in the country at the end of the recruiting trail. It won some battles and lost some. It’s all part of the game. Wilson has gone 15-21 since succeeding Larry Coker in January 2016. The Roadrunners won six games in each of Wilson’s first two seasons before taking a nosedive last year. Saddled with injuries, quarterback problems and a lack of playmakers on offense, UTSA finished fifth in C-USA’s West Division. The Roadrunners have gone 10-14 in conference play under Wilson. UTSA’s offense struggled mightily last year, finishing last among 129 FBS teams in total offense with an average of 247.1 yards per game. The Roadrunners were held to a field goal in two of their losses and were shut out once. The Roadrunners will pin much of their hopes for an offensive turnaround on quarterback Frank Harris, a former Clemens High School standout. Harris was on track to be UTSA’s starting quarterback last year before he tore the anterior cruciate ligament in his right knee during spring training. Harris’ injury came almost 18 months after he tore his left ACL in the eighth game of his senior season at Clemens. Harris redshirted as a freshman in 2017. He has been cleared to participate in workouts and will be among five quarterbacks competing for the starting job, Wilson said. The biggest challenge for the UTSA defense will be replacing middle linebacker Josiah Tauaefa, who announced in late December that he would skip his senior season to enter the 2019 NFL draft. 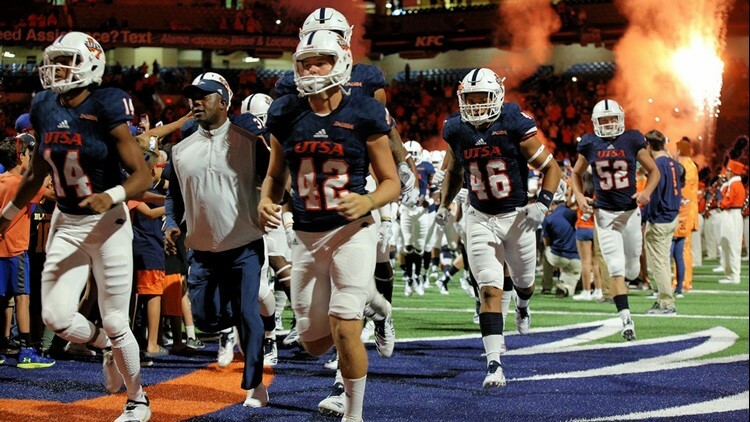 UTSA opens its 2019 season against Incarnate Word on Aug. 31 at the Alamodome. The Roadrunners also will face Baylor, Army and Texas A&M in nonconference play.